The team India skipper Virat Kohli aka Run Machine has made a brilliant record in the first match against Windies. The captain of the team hit a century and with this, he also made 1000 runs in this year in test cricket. Now the record is that it is his third time when he hit more than 1000 runs in the test cricket and that too continuously. Let us tell you that before Kohli nobody was in the international has hit hattrick of 1000 runs test cricket. While spotting on Kohli's record, he made 1215 runs in 2015, 1059 runs in 2016, and now in 2018, he has already made 1000 runs. 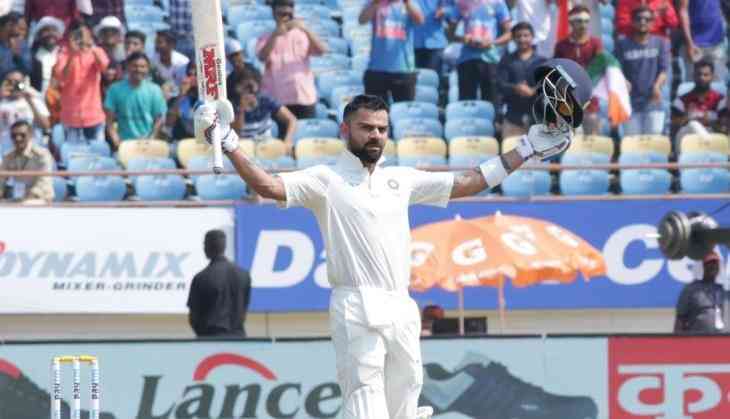 With this century, Kohli also broke the record of great batsmen like Sachin Tendulkar and Sunil Gavaskar, as Kohli hit his 24th century in 123 innings. Whether Sachin hit his 24th century in 125 innings and Gavaskar made the 24th century in 128 innings. However, the year 2018 is now going to end now as team India has to play against Austrailia and there also the team India will three test in this year only.